Tension settings are a style of ring which have a unique style to support and display a diamond or gemstone. Tension settings are sometimes called 'floating diamonds', or 'suspended diamonds', and make the diamond or gemstone appear to float within the setting. Tension settings show much more of the diamond when compared to other types of settings and do so very safely. Tension settings need to be made correctly and only a few have mastered the art. At Novori Jewelry we can custom make matching tension set wedding bands to make a complete ring set for your engagement and wedding rings. Tension settings are different from most other engagement rings settings in that the center diamond or gemstone is not held to the setting by prongs, but rather by exacting pressure from each side of the setting. The physics of a tension setting are such that an exacting amount of pressure is exerted onto the diamond or gemstone to ensure that the setting will not release the stone. 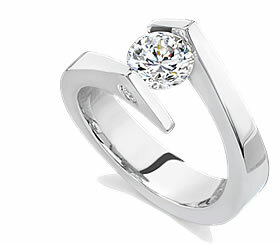 The tension setting is made with alloys that provide the required tension and keep the tension for the life of the ring. A typical ring does not have these properties. These principles of pressure holding the diamond in place have existed since tension settings were first introduced in the early 1960's. Most people purchase a tension setting simply because they like the way they look. There really is no other setting style that has the unique look of a tension setting. 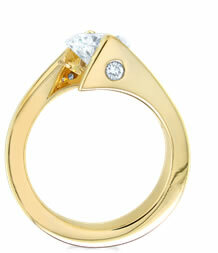 The special feature of a tension ring is that it will showcase the diamond in a fuller manner. This means that you will see more of the diamond you have purchased and be able to enjoy the diamond more. More light will be able to enter the diamond and thereby giving the diamond more sparkle. In a typical prong setting, the diamond is sometimes covered or hidden by the setting and prongs. With a tension setting, the diamond or gemstone floats within the setting and provides an excellent view of the gemstone. Once you see a tension ring, there is no other ring that comes close. Since a tension setting is somewhat unique, it also appeals to those who want something just a bit different, and maybe just a bit more special. A tension setting always gets an extra look because most people have not even seen such a unique and beautiful ring. As with any other piece of jewelry, you want to take good care of the ring and make sure it does not get hit or abused. Although a tension setting may appear more fragile than other rings, the opposite is more true. The pressure mounting on the gemstone keeps the stone safe and secure within the tension setting. A typical prong setting can be damaged if just a single prong is bent or snagged and tension settings protect the diamond or gemstone by having more metal surrounding the stone. Properly made tension settings by Novori cannot be pulled apart by hand and make a secure setting for the center stones. As you can tell, tension setting are made to fit a particular gemstone and for a particular finger size. The methods normally used to resize a ring simply cannot be used to resize a tension ring which makes sizing a tension ring very difficult and costly. Always ensure you have a ring size that has been measured by a jeweler before ordering a tension setting. Unfortunately we are required to charge for any tension ring resizes. Contact a jewelry consultant at Novori Jewelry for details. If you are planning to order a matching tension set band, you should considering ordering them both at the same time to ensure they have a perfect fit. Otherwise you will have to send the engagement ring back to us to ensure an exact fit. These are just a few things to consider when buying a tension setting. Tension settings have a unique style and are sometimes called tension mount rings, tension rings, tension set diamonds, floating diamond settings, suspended diamonds, pressure set diamonds, pressure set diamond rings. All these names represent a style of ring that is unique and beautiful. . We are tension ring experts so if you do need assistance, just call a jewelry consultant at Novori toll free at 1-877-877-4141. We will be glad to assist you in any way we can.